SANTA ROSA—The Sonoma County Board of Supervisors renewed a contract impacting thousands of Service Employees International Union in-home care workers this morning, despite claims that organizers inappropriately barred some members from voting for representation. A group of in-home support services workers staged a protest on administration steps this afternoon opposing the three-year memorandum, which goes into effect Thursday. Several supervisors expressed concerns with the union during a public meeting this morning, but the board unanimously approved the agreement. According to protesters during the 1:30 p.m. gathering, the union for the first time this year did not allow members to send ballots through the mail and did not provide a copy of the contract. Voting was limited to polling locations at difficult times and places and it was also charged a security guard was hired to “block” workers known to oppose the union, according to protesters. Los Alamitos, Calif.—More than 40 workers at Los Alamitos Hospital have won their election to form a union with the National Union of Healthcare Workers (NUHW), despite an aggressive effort by another union to stop them. The workers are employees of Hospital Housekeeping Systems (HHS)—a subcontractor that fails to provide affordable quality health insurance for the workers who spend long hours keeping the hospital clean for others. 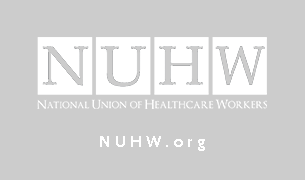 Hospital Housekeeping Systems (HHS) workers at Los Alamitos Hospital voted 35-to-7 to form a union with NUHW, despite an aggressive effort by another union to stop them. The scandal-plagued SEIU, widely condemned for its attacks on other unions, had tried to intervene. After the National Labor Relations Board (NLRB) rejected SEIU’s attempt to block the election by filing frivolous legal charges, SEIU tried to compete in the election—but abandoned their effort last week when they failed to win any support from workers. By now there is something to be learned from the bitter internecine battles that embroil Andy Stern of the SEIU, Sal Rosselli of the new National Union of Healthcare Workers, John Wilhelm of UNITE HERE, and Bruce Raynor of Workers United. It is becoming clearer that this is no mere struggle for power among ambitious union leaders. It involves a sharp challenge to Stern’s favored conception of a labor movement highly centralized at the top and regimented below. It marks an important break in the trend toward superbureaucratization of the American labor movement. That challenge is manifested in two new union constitutions: one, adopted in haste as the founding constitution of Rosselli’s NUHW; the other, the extensively revised constitution of Wilhelm’s UNITE HERE, just adopted at its convention in July.